When it comes to communication apps we don’t lack for choice. We can message to our hearts content with WhatsApp and make video calls on Tango. And then of course there’s the granddaddy of them all, Skype, which changed how we thought of digital communications. But each of those services has its limitations. Those apps — which include Skype(s msft), Pinger, WhatsApp, Tango and Viber — are all great apps, said Julien Decot, the new VP of business development and monetization at TextMe. The problem, Decot claimed, is they’re five separate apps, each specializing in a different set of features. TextMe, however, has a plan to combine the best aspects of each of those services into a single multidimensional communications tool. Decot spent the last five years at Skype tailoring the VoIP giant’s corporate strategy, and while he believes Skype has designed a juggernaut of a communication platform, it was one that was always optimized for a PC environment. The hole Skype left in mobile was filled led by numerous mobile over-the-top (OTT) communications apps like WhatsApp. What the market needed, Decot said, is a made-for-mobile Skype incorporating the new features of the emerging class of OTT apps. Note: This story is just one in an occasional series of stories on important under-the-radar mobile startups. Microsoft obviously wasn’t going to rebuild Skype from scratch, but Decot found his new Skype in TextMe, a 2-year-old San Francisco bootstrapped startup, which has already seen 10 million installs in the last two years of its Android(s goog), iOS(s aapl) and Windows Phone apps. TextMe provides a unified voice, messaging and video chat platform, but it can also reach beyond its own network of users to touch any phone number in the U.S. and more than 200 other countries. It’s designed a device-agnostic platform that can turn any tablet into a phone. And to top it all off it’s created a “freemium” charging platform that allows customers to earn credits for services they would normally pay for. One of the most interesting aspects is how it has overcome one of biggest problems plaguing a new over-the-top app developer: cultivating the network effect. To become truly useful, a communication or social network needs a large number of users. TextMe has solved this problem by issuing every user a phone number just as Google Voice does in the PC world. That means any TextMe member can automatically send and receive text messages from any mobile device as well as place or receive calls from any phone — whether or not the person at the opposite end is a TextMe user. Of course, not all of the services are free. As with its competitors’ apps, all in-network SMS, voice and video communications are gratis, but TextMe also doesn’t charge for out-of-network text messages to U.S. numbers or for any inbound call, no matter where it originates. TextMe charges for phone calls to non-TextMe numbers, both domestic and international, and this week TextMe this week also introduced a paid international SMS feature. Customers start out with 10 free credits, which is enough for a 10 minute domestic or U.K. call or a two-and-a-half minute call to France. TextMe sells credits in buckets: $1 for 40 credits or $10 for a bundle of 500. But the startup also offers ways for customers to earn credits through promotions. If you watch video advertisements or download promoted apps from your devices app store, you’ll accrue credits in one-to 20-point increments. Forget innovation. We need aggregation. Like I said before, all of these features are available in one form or another in other OTT apps. Pinger assigns phone numbers to handle its voice messaging and out-of-network texts and calls. Skype and Tango offer in-network video chat, and Skype offers exposure to the wider telephone grid with SkypeIN and SkypeOut. WhatsApp is the king of rich-media mobile messaging. TextMe just wraps them all into a single service. TextMe has so far focused its efforts on smartphones, tablets and iPod Touch (effectively turning the Wi-Fi device into a softphone), but the company is exploring PC clients — bringing it full circle back to Skype — and even WebRTC browser-based communications technologies, Decot said. TextMe will even let you make a mobile phone call without a mobile network connection, tapping into Open Garden’s ad hoc mesh network. As for competition, take your pick. There is more OTT software in mobile app stores than you can shake a line of code at. The company closest to TextMe’s model, though, is the similarly named TextPlus (formerly named Gogii), which also issues a phone number to each and every user. Last time we checked, TextPlus had racked up 27 million users, and it is even showing signs of adopting an earned-credit charging model via a new partnership with FreedomPop. 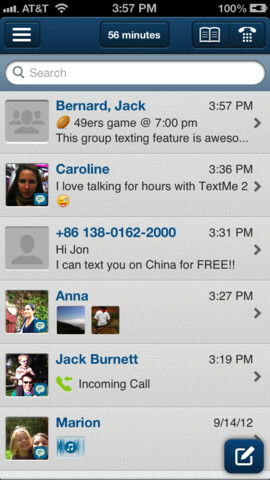 TextMe, though, has stumbled onto an interesting idea. A quick look at my smartphone reveals a miasma of IM, chat and social communication apps. If I wanted to reach out to my wife there are literally 20 different services I could use to reach her. Each of those services offers some kind of compelling feature to recommend it — not only could I call, IM, text or video chat with her I could use an app like Sidecar or Glympse to let her know where I am or where I’m going. What I really want is one service that does all of the above. Correction: An earlier version of this post stated that TextMe was able to reach 40-plus countries with its international voice and SMS services. The company recently expanded its reach to over 200 countries. I think one should not forget to mention yuilop as the main competitor to textme and they are also coming to the US. They also offer free calls to all phone numbers worldwide, free SMS, VOIP + IM. According to TC they are actually racking up 5 mio users in Europe which would make them the market leader in Europe. Was going to try it out but after about 20 attempts at creating a username with no luck I gave up. I don’t get why they don’t use my email address as my identification. Grr!! > What I really want is one service that does all of the above. I’m sure many readers will disagree. The days of service aggregation are gone. Do one thing, but do it right. Multitasking and fast app switching do the rest.